Having the security in knowing that the repair that your refrigeration company did will last shouldn't be surprise. Lost product, lost revenue, and the worst case customers, because of a poorly trained and dishonest service company that is only interested in your hard earned money. Sound familiar? Our company can design custom systems for any application. We are different. Factory trained technicians, ongoing training, specializing in all types of refrigeration equipment from Ultra Low Freezers, Environmental Test Chambers to Ice Machines. Whether it's a design you are looking for, or maybe a new Installation. We service and install most equipment and refrigeration commonly found in the following facilities, just to name a few. Whatever your needs are we can help. 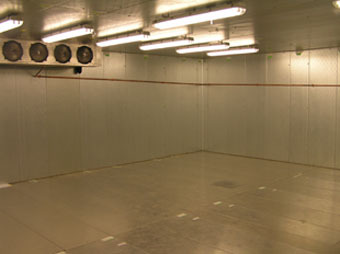 Need a test chamber or large freezer designed, delivered and installed? Not a problem. Whether it is a large bid job or a small commercial system we can get it done. We are a SAM Contractor. We understand you need as little down time as possible when something goes down. With all the scheduling and time line problems on existing and new construction, we can get the job done faster with our 24 hour Service and Installations. Contact us. We can tell you how. Why go anywhere else, we do it all! With 28 years of Service and Installation experience in the refrigeration and construction industry, you can count on our factory trained technicians carrying OEM parts to give you the best repair and installations in the industry. Anything from multi unit commercial or ice machines to large refrigerated warehouses. Our staff can design, consult, service and install just about anything that you can imagine. We service and install all makes and brands of environmental test chambers, walk in coolers, reach in coolers and ice machines. University of Michigan, Beaumont Hospital, Multiple Military Bases and Government Facilities, St Johns Hospital, Henry Ford Hospital, Hackensack Medical Center, Metropolitan Hospital, University of Texas, Institute of Surgical Medicine, Sun Health, VAMC hospitals, Hartford Medical Center, Heart of Georgia, Mayo Clinic in Florida, Michigan State University, Seton Medical Center in Texas, Baylor College of Medicine in Texas, Children's Hospital Dallas,Texas and Philadelphia, Children's Hospital Denver, Texas A&M. We design and consult on custom refrigeration equipment. If your establishment is looking at a new project or an ongoing system problem, we can offer our consulting services to help the job run a little bit smoother.